Mount your tube and mandrel into the vise. Start your thread on the liner tube and work back to the hybrid tube. Select a burnt purple schlappen feather. 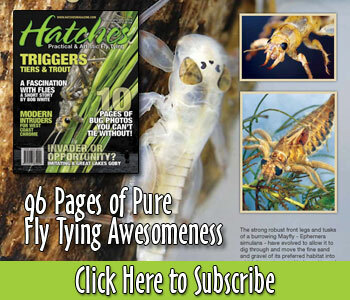 Nick did a great article in the 2008 issue of Hatches on burning schlappen. To get a copy of that issue and other back issues, visit our store Here. Great pictures. Easy step by step illustrations are a real confidence builder. Can’t wait until I try my hands on it both in the vice and learning how to swing it.